Fulbright New Zealand’s executive director, Mele Wendt, has announced her resignation from the organisation, which will take effect in December. Mele joined Fulbright New Zealand at the beginning of 2005, and says that after 10 years – a period of significant growth and consolidation – a change in leadership will be good for both her and the organisation. Mele’s resignation was announced to US alumni and stakeholders at a reception at the New Zealand Embassy in Washington, DC on 6 June, at which Matt McMahon from the US Department of State’s Bureau of Educational and Cultural Affairs presented her with a memorial Fulbright globe and an official certificate of appreciation signed by Evan Ryan, Assistant Secretary of State for Educational and Cultural Affairs. The certificate acknowledged Mele’s “ten years of exemplary service as Executive Director of Fulbright New Zealand and noteworthy contributions to the success of the Fulbright Program between the United States and New Zealand”, and made special mention of Mele’s work on strategic planning, risk management, emergency management and public-private partnerships, which serve as models for other Fulbright commissions worldwide. Fulbright Foreign Scholarship Board chairman Tom Healy also attended the reception to pay tribute to Mele’s strong leadership of New Zealand’s Fulbright programme. Back in New Zealand, Mele’s resignation was announced to attendees of the annual Fulbright New Zealand awards ceremony and alumni reception at parliament on 24 June, by Fulbright New Zealand chairperson Helen Anderson. 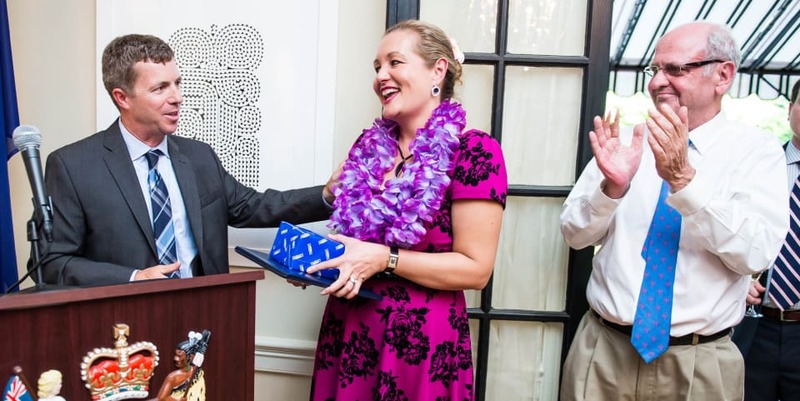 Helen paid tribute to Mele for being such a warm and welcoming “face of Fulbright New Zealand” in her interactions with applicants, grantees, alumni and stakeholders throughout her tenure as executive director. She commended Mele’s leadership of the organisation during a period of significant growth in the number of awards offered, despite some challenging financial times. She added that the Fulbright New Zealand Board “will do our best to find another capable and inspiring leader for the commission,” with an appointment to be confirmed by November. Mele says she has been overwhelmed by the support and feedback of alumni and others since announcing her resignation from what has been a “dream job”. Mele is only the fourth executive director of the Fulbright New Zealand commission in its 66 year history. In her view this demonstrates how rewarding and satisfying the role is, and she is not surprised by the high level of interest in the position by potential applicants.